Everyone seems to have their own tips for losing weight. But do they work? Are they realistic? We’ve got tips, too. And ours work. Here are 5 easy AND effective tips to help you shed some pounds. After age 25, a decrease in your body’s metabolic rate causes the average person in the US to gain between 1 and 1.5 pounds per year. That doesn’t sound like much, but it adds up. By age 40, you’ll be carrying an extra 15-20 pounds. So no matter what your age, everyone can use some weight loss tips! Your mom was right – breakfast is the most important meal of the day! Try starting yours with bacon and eggs. In 2009, researchers at Purdue University discovered that a high-protein breakfast helps people feel more full all day long. This makes it less likely that you will over eat or over snack. Don’t like bacon and eggs? Try other high-protein breakfast foods like low-fat or non-fat dairy products (milk, yogurt, cottage cheese, or cheese), nuts and nut butters (like soy nut or peanut butter), or avocados. It’s very important that you get a full night of sleep. Studies have shown that a lack of sleep effects the hormones leptin and ghrelin , which play a key role in turning your appetite on and off. The disruptions caused by a lack of sleep make you feel hungrier and less satisfied by your meals and snacks. Most adults need 7 – 8 hours of sleep each night. Certainly, this isn’t always possible. If you don’t get your 7+ hours of sleep, be aware that your body is working against you and trying to make you eat more. So be vigilant and try to exercise a little more self control with your meal and snack portions. And try to catch up on your sleep as soon as you can! Green tea get’s a lot of hype. But in this case, it’s actually (mostly) true. Drinking green tea or taking green tee extract supplements will help you lose weight. Since this is such a popular topic, we wrote a whole article on it. You can find out more here: How To Use Green Tea For Weight Loss. Ready for another surprising weight loss tip? 20 minutes before a meal, grab a handful of almonds or other nuts or seeds. The high protein and fat content of the nuts will help you start to feel full sooner, so you are less likely to overeat at your meal. 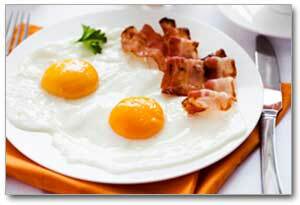 Does the high fat content worry you? Luckily, the fat found in most nuts and seeds is mostly monounsaturated fat – the healthy fat! Almonds are a particularly good choice because they have numerous health benefits. A study in the International Journal of Obesity found that overweight and obese research participants who added almonds to their diet experienced a 14% reduction in their waistlines and an 18% decrease in their body mass index (BMI). Spicy foods that contain the naturally occurring chemical capsaicin and other similar compounds help speed up your metabolism, causing you to burn more calories. Studies have found that the boost varies from 8% – 23% and it’s unclear how long the boost lasts. But every little bit helps, right? The best source for capsaicin is hot peppers. So spice up your food by cooking with fresh hot peppers. You can also add raw hot peppers to salads and other entrées. Or try spicing things up with hot pepper sauce, red-pepper flakes, or cayenne powder. As a bonus, capsaicin also decreases your blood cholesterol, aids in digestion, and prevents bacterial infections. Plus it’s an antioxidant. So how can you go wrong! Well, that sums up this batch of tips. Give them a try and leave a comment below to let us know how they work for you. And if you you are looking for more, you can find more tips here. I’m having my new year’s resolution again and I wish that I can make it this year. These are all great tips. One thing that I have found, is to elimanate soda, cold turkey. I have lost over 29 pounds in two months by putting it in perspective. I drank soda for over 30 years. The perspective of soda was adding over 1,000 (that is thousand) calories a day to my diet. That should have an effect. The first 3 weeks were a bear. If you don’t think losing a little weight will help in your everyday life, just try filling a gallon jug and carrying it around a few hours. The jug weighs about 8 pounds and if you lose it or set it down, you will notice instant relief. Yes all the tips for weight loss is very effective. Diet helps a lot in weight loss especially if green tea, water, egg are added in your diet chart. Sleep is very important.